When you go shopping don’t you love a 2 for 1 special or buy one, get one free (yes – my wife educated me on what the term “BOGO” means)? Well imagine you could get 2 rooms in your home for the price of one! Yes – it is possible to combine a laundry room and a walk in closet as one smartly integrated room. But wait there’s more (can’t you just hear the cheesy guy’s voice saying this?)! As a bonus tip you’ll get this combined room (which in this specific home has been named “the wardrobe”) designed in a way that anyone (irrespective of their height or level of mobility) can effectively use it (hey – that might be a 3 for 1 special). This specially designed home is called the Universal Design Living Laboratory (UDLL for short) and is located in Columbus Ohio. It’s owners are Rosemarie Rossetti and her husband Mark Leder (I’m fortunate to say they are good friends of mine). In the first part of this series I focused on the closet portion of this combined room (click this link to learn about the universal design closet in part 1). 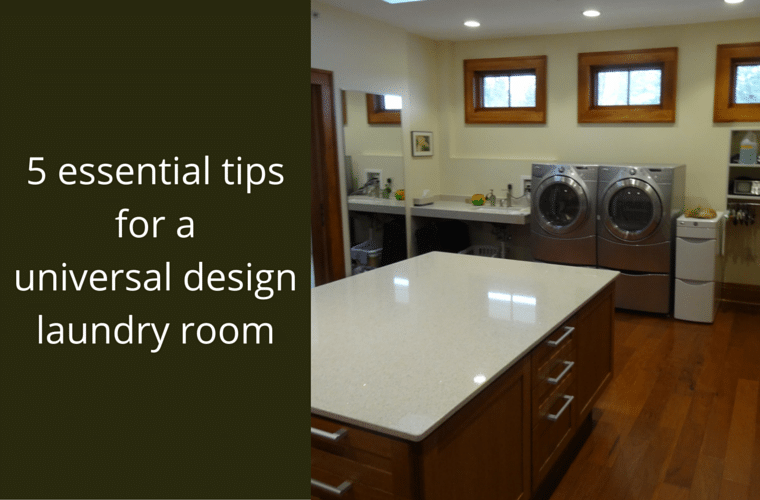 In this second article we’ll take a look 5 tips for the laundry room which has been designed using “universal design” principles. Universal design is making spaces which can be used by anyone from grandparents to grandchildren, or someone in a wheelchair to someone in a standing position. 'Universal design is thoughtful #design.' Click To Tweet These design ideas can improve the function of this “unfortunately” important room (the reason I say unfortunate is the laundry room is not usually most people’s idea of the number one place they want to hang out!). While these 5 tips for a universal design laundry room can help the functioning of any laundry room (whether it is combined with a walk in closet or not) – there are no tips which will magically get your laundry done for you (bummer – that would make this a super-valuable article!). One of the reasons laundry rooms are depressing is they are often hot, humid, windowless and dark (I guess laundry rooms are like saunas without the enjoyment and relaxation!) places where you are taxed with working on dirty things. A key way to make any workplace better is through natural lighting. In the UDLL home there are 3 transom windows which provide daylight and give privacy in the combined laundry room and walk in closet space. In addition there is an operable Velux skylight (which automatically closes if it rains – now that’s cool) to dry out clothes fast. Natural lighting makes the space safer (it’s easier to see things) and nicer. 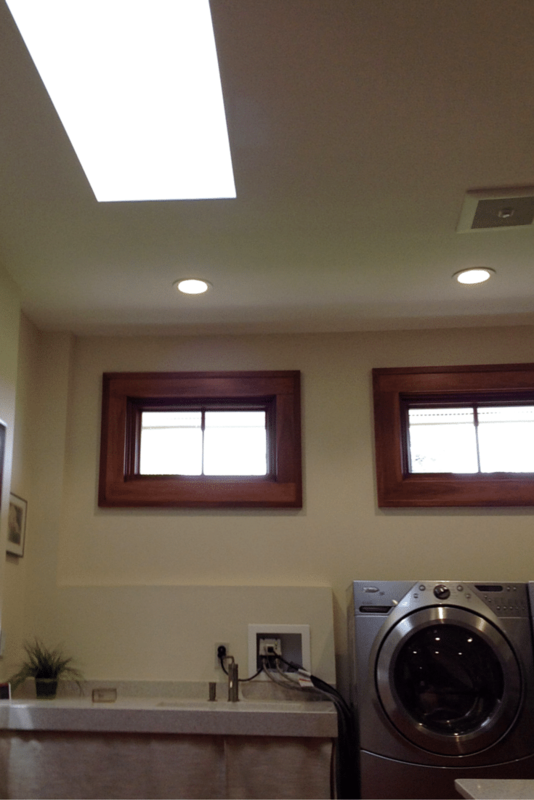 Could you benefit by adding a skylight or transom window to your laundry room? 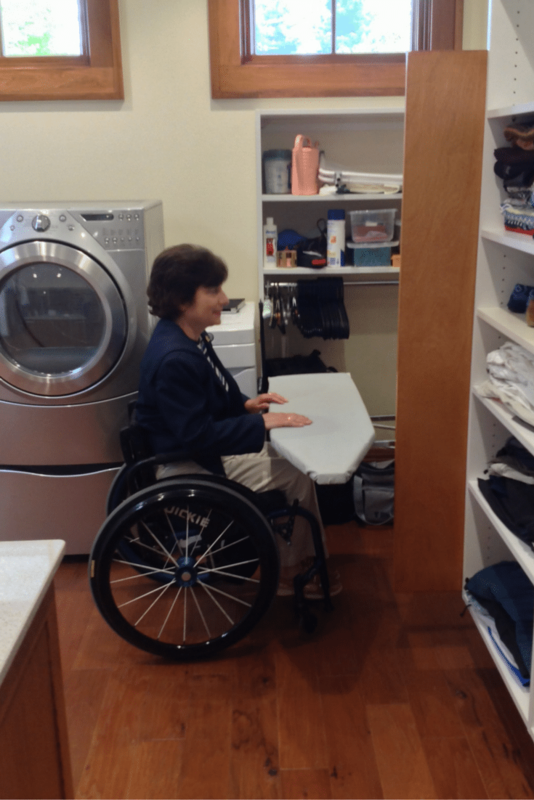 Designing a laundry room counter which works for Rosemarie who is 4’1” tall seated in her wheelchair, and Mark who is 6’4” can be challenging. In this instance the combined closet and laundry room island countertop was set at 34”. Since one of the goals of this project was to use sustainable products an eco-friendly countertop was selected. Eco by Cosentino from Silestone is made of glass, mirror, porcelain earthenware and vitrified ash. This counter is a handy place to fold laundry, set out tomorrow’s wardrobe or for Rosemarie to mend garments. Ergonomics are important in any design– but it was an especially important consideration for this universal design given Mark and Rosemarie’s differences in height. Most washers and dryers are set directly on the floor. This location can be difficult on the back of someone in a wheelchair to reach. Given this challenge both units were set 17” from the floor which makes it easier for everyone. Good design is intuitively easy to use. Bad design is frustrating and painful. 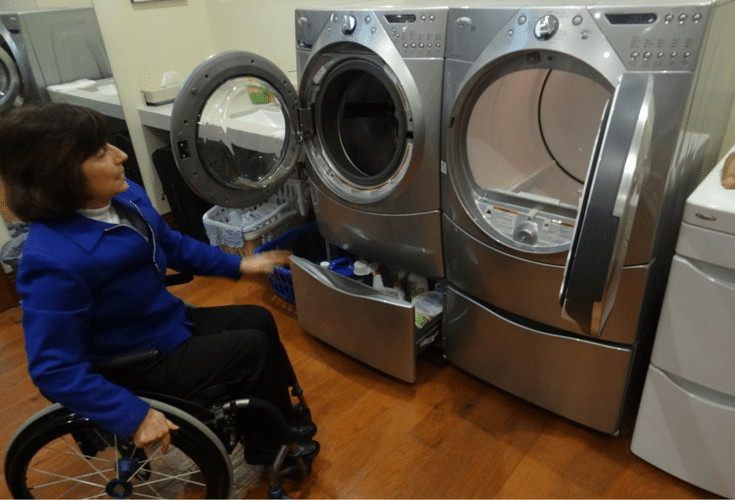 When choosing the best washer and dryer for a universal design pay attention to how the doors are hinged so it is easy to transfer clothes from one unit to another. Rosemarie and Mark put the washer on the left with a left opening hinge and the dryer on the right with a right opening hinge. This makes their clothes transfer super easy. 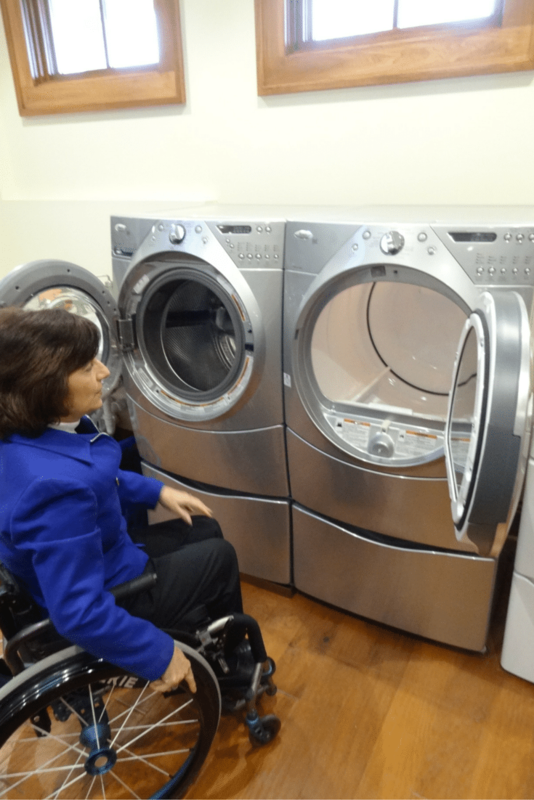 The front loaded design is simple to use compared to a top loaded washer and dryer. While some people actually love to iron (I’m fortunate enough to have a Mother in Law with this unexplainable passion for ironing) most people dread this task. I think we can both agree that if you can get ironing done with minimal hassle that would be a good thing. The challenge was to create an ironing station which can work for people of different heights – yet conserve space (laundry rooms are not usually the most spacious rooms in the house). An adjustable fold down unit from Iron-a-Way was chosen. It can be pivoted 90 degrees and has height adjustments to make it work for Mark and Rosemarie. Since the board is attached to the wall it eliminates the need to have to set up a large board (which would be tough for Rosemarie to do). Laundry rooms can be frustrating in the best of cases – but when you combine people with vastly different heights and abilities to get around the needs for a smart universal design certainly goes up a notch. Whether you have the space for a “two for one special” (combining the master walk in closet and the laundry room) or not – these universal design laundry room tips will help make the least favorite room of your house work better and give you time to spend on more fun things. If you want more help with a laundry room design, laundry room cabinets or a closet organization system comment or call the numbers below. Follow the author @Mike_Foti or our companies’ @InnovateBuild and @InnovateHomeOrg on Twitter. Nice Post. 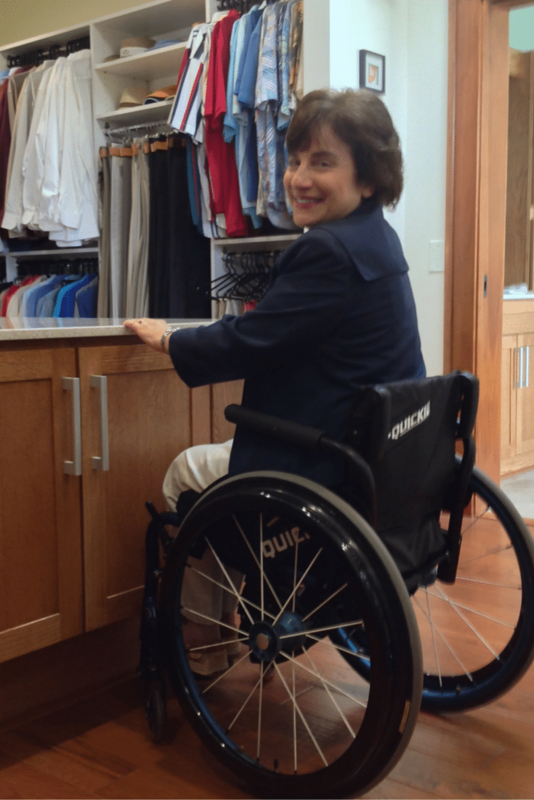 Your tips are very important for who lost movements and depends on a wheelchair. Thanks Adriano – I’m glad you found these tips of value. Since we are living longer the need to have spaces designed to help us through this process is very important.